Fernando Botero (born 1932) is perhaps one of Latin America’s best-known living artists. He is internationally renowned for his figurative subjects, which explore the exaggerated and inflated human form. Botero’s sculptures, canvases, and works on paper celebrate voluptuousness, playing with pre-conceived notions of sensuality, fertility, and power. His works tackle many of the major themes and iconic images found in the western tradition of art with a sensitivity that is at once playful and critical. As evidence of his wide reaching impact, many use the term “Boterismo” when describing the influence of his signature full-figured compositions. Botero was born in Medellín, Colombia, in 1932. He began painting at a young age and it was not long before others recognized his talent. Botero was published as an illustrator at age 17 in El Colombiano, the weekly literary supplement of a daily newspaper. 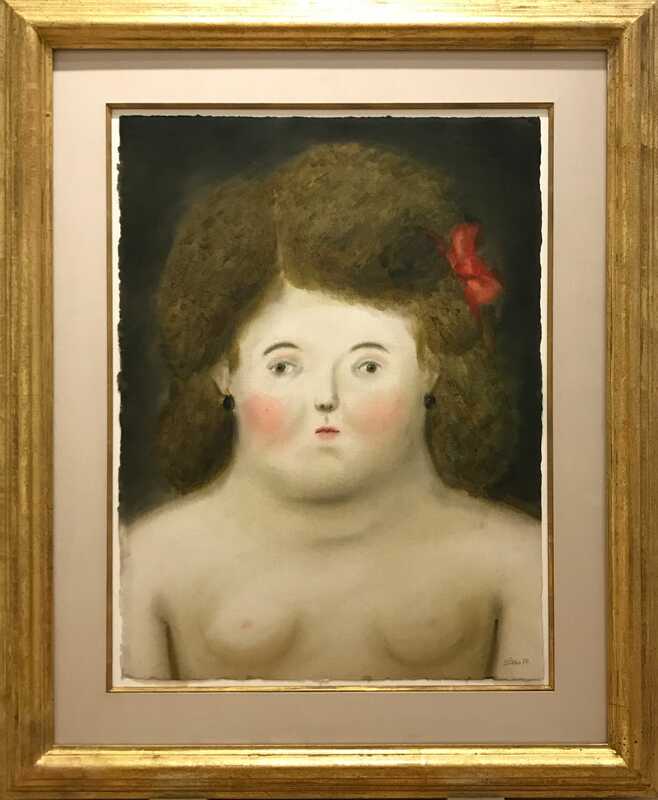 In 1948 Botero’s artwork was exhibited in a group show in Medellin. In 1951 he moved to Bogotá and encountered a group of avant-garde thinkers. The same year, Botero’s first solo exhibition was held in Bogotá at Galería Leo Matiz. Botero went to Spain with a group of artists and studied in Madrid from 1952 to 1953 at the Academia de San Fernando. He then moved to Paris for a short time, where he was inspired by the masterworks held in the Louvre. Living in Florence from 1953 to 1954, Botero studied Renaissance works by Giotto, Paolo Uccello, and Andrea del Castagno. In 1955 Botero returned to Colombia and graduated from Medellín University. During a visit to Mexico in 1956, Botero created his first figures with a rotund appearance. Botero won first prize in the National Salon in Bogotá in 1958. His painting was inspired by the frescoes of Mantegna in the Camera degli Sposi in Mantua. In 1960 Botero moved to New York City. The same year he was awarded the National Prize for Colombia from the Guggenheim Foundation. In 1961 the Museum of Modern Art purchased his Mona Lisa, Age Twelve. During subsequent years, Botero experimented with various styles. Influenced by Abstract Expressionism, Botero’s work evidenced an aggressive handling of paint before settling into his mature style, which eliminated all traces of brushwork. Botero continued to take inspiration from his Colombian heritage, frequently portraying scenes of middle-class families, military life, exotic still lifes, opulent lifestyles, and small-town culture. Botero left New York City in 1973 and moved to Paris. There he began sculpting the rotund figures that he had perfected in paintings. In 1993 fourteen bronze sculptures were installed along New York City’s Park Avenue in conjunction with the Public Art Fund in order to bring the city’s residents into contact with the contemporary master. Botero continues to exhibit throughout the world. 1978/80 – Hirshhorn Museum and Sculpture Garden, Smithsonian Institution, Washington, D.C.
1960 – “Botero,” Gres Gallery, Washington, D.C.